Last Friday was the first weekly distribution of Shelton Family Farms’ 2012 Community Supported Agriculture program. Now in its fourth year, the Shelton’s CSA provides members with 25 weeks of fresh produce neatly packaged in a take-home box. 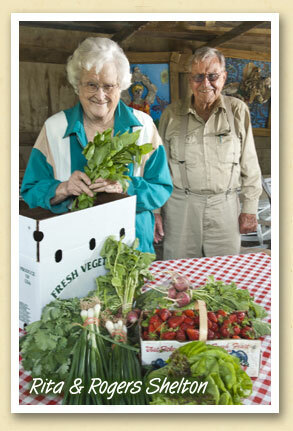 Above, Rita and Rogers Shelton pack this week’s box with kale, spring onions, lettuce, radishes, basil and strawberries. The selections will change from week to week throughout the season as each vegetable reaches harvest maturity. Located in Whittier on what was once the William Holland Thomas farm, the land has been farmed by the Sheltons since Rogers’ grandfather bought the property in 1922. Today, the fourth generation of owners includes William and Sabrina Shelton, along with sons Wil, Sam, Cal, and Tom. The Sheltons will continue to accept memberships in their CSA throughout the season with fees prorated. You can find more information on their website, SheltonFamilyFarm.com.